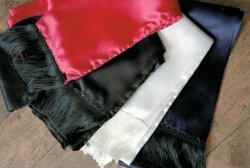 Finished with a 4 inch fringe, our satin sash is a full 3 yards long. Tie it at your waist, or use it as a headwrap. It makes a nice alternative or addition to a belt. Made in USA. Dry clean only.